Artful accents shape the ambiance and personality of this gold stripe glass cylinder table lamp. 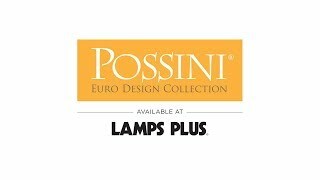 Possini Euro Design® presents a captivating lamp that lends a delicate yet commanding tone to a bedroom or living space. Lovely gold and white stripes adorn its cylindrical glass base. This gold stripe glass cylinder table lamp offers versatility that works in every room, from a nursery to an elegant dining room. Overall: 28 1/2" high. Shade is 10" high x 15" wide. Takes one 150 watt E26 base bulb (not included). Aubrey cylinder table lamp by Possini Euro Design®. Gold stripe finish. Glass construction.